Front Office Staff - Mary Kate (MK) DiSalvo is the Practice Manager and in charge of all administrative functions, including insurance billing. Kim Rabin is our full time receptionist. Dominika Lichomska is our front office assistant. Teresa Rough is responsible for accounts payable and bookkeeping. Our Clinical Support Staff - Dawn Bria (Medical Assistant) is in charge of all Nursing functions. 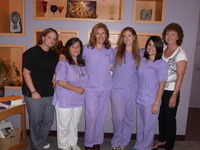 She works works with Mayra our LPN and Alex our Registered Nurse. Dawn has been with Dr. Evans in many different roles since he first started practice in Stamford over 20 years ago and he fully expects her to be with him for the next twenty years.